In 1992 the orchestra was invited by the Southern Orchestral Concerts Society to become the resident chamber orchestra for its annual concert series based at Petersfield Festival Hall. In this series it performed with many distinguished national and international soloists, including in recent years Alison Balsom (trumpet), Natalie Clein (cello), Michaela Petri (recorder) Nicholas Daniel (oboe) and Antje Weithaas (violin). In an exciting further development, in 2013 Southern Pro Musica was appointed by Guildford Borough Council as their ‘principal provider of Classical music’, providing a broad range of orchestral concerts and educational outreach work in Guildford. We are delighted to have the distinguished clarinettist Michael Collins as Honorary President of the orchestra. In addition to its orchestral concerts, Southern Pro Musica undertakes an annual series of children’s concerts each year, introducing live orchestral music to many thousands of young listeners in Winchester, Petersfield, Worthing, Portsmouth, Chichester, Southampton, Guildford and Dorking – a series which has been generously supported since its inception by the John Lewis Partnership and, more recently, by the Foyle Foundation which has provided funds to enable children from state primary and junior schools to enjoy attending a concert. 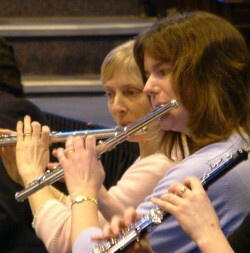 In its work providing first-class professional orchestral support for leading choirs in the south, the orchestra performs regularly with the Portsmouth Choral Union, Chichester Singers, Guildford Choral Society, Southampton Choral Society and the Petersfield Festival and has also worked with the Winchester Music Club, Sussex Chorus, Dorset Guild of Singers, Epworth Choir, Froxfield Choir and the Wokingham Choral Society. - ensures that Southern Pro Musica complies with GDPR (General Data Protection Regulations) and follows good practice, protects the rights of customers and is transparent about how it stores and processes individuals' data. Southern Pro Musica is a professional chamber orchestra promoting orchestral concerts and working in partnership with leading choirs and musical charities in the South. Southern Pro Musica is also Guildford Borough Council’s ‘principal provider of Classical music’, providing a broad range of orchestral concerts and educational outreach work in Guildford. Southern Pro Musica is a registered charity no. 1148872. Details of the Trustees of the charity can be found at www.gov.uk/government/organisations/charity-commission. We collect from you your email address and/or name and/or postal address to help us promote and market our activities. We are committed to protecting your personal data and we have put in place reasonable physical and technical measures to safeguard the information we collect in line with the GDPR. We will never pass on your details to third parties for their own use, although we will sometimes use reputable and secure third-party services such as Mailchimp and postal mailing houses to market our own activities. You will always have the right to request details of personal data which we hold; the right to update this data; the right to stop receiving marketing communications and to have your data permanently erased. You can find out more about your rights at the Information Commissioner’s Office website: www.ico.org.uk. All communications from us will include a clear option for you to opt out or update your preferences. You can also request to view your personal information, update your details, or to be removed from our mailing lists either by contacting marketingSPM7@gmail.com or info@southernpromusica.org, or by writing to Mailing Lists, c/o 3 The Square, Compton, Chichester, PO18 9HA. In the case of your opting out your data will be erased promptly and no later than 28 days following your request. Who’s responsible for data Southern Pro Musica collects? SPM is a Data Controller under the GDPR. For any queries about GDPR or relating to this Privacy Notice, contact the Data Controller at info@southernpromusica.org. If we make changes to our Privacy Notice or processes we will post the changes on our website.